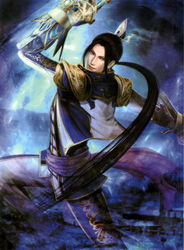 Zhang He is a general in the Dynasty Warriors series. He is based on the historical figure from the Three Kingdoms period in China. The historical figure was not, reportedly, as effeminate as he is portrayed in the game. In the series, he is represented as graceful and obsessed with beauty and elegance. That said, although he is read as homosexual by Western audiences, there is no confirmation of his sexuality in the series. One site points out that he does not have a love interest, unlike the other male generals in the game. You can see him in action in this video, in which he does seem to be implicitly coded as a gay character. This entry was posted in 1990s, Gay, Gay (implicit), Playable Character, Queer Men on September 2, 2015 by Adrienne Shaw.